Buster and Teri Brown, co-managers of Sequel New York, with Wrangler, a colt from the first crop of Laoban. It's been a busy month for Wrangler, the colt from the first crop of Sequel New York stallion Laoban who will represent his sire at the Fasig-Tipton Saratoga Fall Mixed Sale on Oct. 15. The colt was weaned from his mother on Sept. 4, and he's begun working in earnest toward the sale, where he will be one of 20 weanlings in the catalog by Grade 2 Jim Dandy winner Laoban, a son of Uncle Mo out of a stakes-placed mare by Speightstown. Wrangler, named after the Wrangler Stables partnership of Sequel New York's Becky Thomas and Lyn Burleson of Burleson Farm, will go through the ring as Hip 180. In the latest edition of this series, we check in on the now five-month-old Wrangler, with updates from Sequel's Thomas, Molly Lightner, and Teri Brown. Brown: Overall, he handled it very well. He called for his mother for a while, then just accepted that she wasn't coming back. He was pretty independent before weaning, which always makes it easier. His personality has remained the same, he is very sensible and is usually easily coaxed into doing the right thing. He is never mean or nasty like some colts can be. He lost a little weight from weaning, but is eating well and has started to pick up weight again. He is still very balanced and is growing. Thomas: He's been an excellent sale boy. Some of them don't take to sales prep as readily, but he's been an excellent sale horse. I wish our weaning wasn't so late, because it's difficult to get one shaped up after they go through the weaning process. They all lose weight, and to be able to build weight, he's on a weight-gaining program, and hopefully things keep coming. Brown: He still comes in out of the sun during the days and goes out at night. It has been warm, so no need for a blanket (yet). His sales prep of good feed and oil, grooming, leading, standing, etc. continues. He is more of a leader out with the other weanlings. He has another weanling he “hangs” with and he is definitely the one who makes the decisions. Lightner: When Becky was in New York in August, she went to the farm in between the Fasig-Tipton Select and New York-Bred yearling sales to look at the foals and to pick out which Laoban foal she would send to showcase. Once she decided on Wrangler, we logged in to our new consignor portal at Fasig-Tipton on ship-in day for the New York-Bred Sale and got him entered, just before the deadline. The difference between entering weanlings into a sale versus any other kind of horse is that a lot of them aren't weanlings yet when you enter them, and are still with their mothers. Also, a lot of them aren't registered yet. So, once the decision is made to enter them in the sale, the ball starts rolling on the paperwork to make them official: get the stud fees paid, etc. Brown: Sale prep for a weanling is basically the same as for a yearling except less intense “physical” work such as lounging or working in a round pen for muscle building. This type of activity would be too strenuous for such young legs. Compared to the weanlings not headed to the sale, he stays in during the day and gets more attention as far as grooming, practice leading, and standing, just more overall handling. Thomas: I don't set expectations until we're on the sale grounds and see how the horse is received within the market. With the market being as polarized as it is, the top of the market, regardless of where it is, is going to be high. Those horses that are not perceived at the top – especially in Book 5 or 6 at Keeneland – you see a lot of $20,000 and $25,000 stud fees bring less than that, and it's the same in the regional market. You kind of need to be perceived at the top. When we're on the sale grounds and see how many second looks that we start getting, then I'll have an idea of what we're going to bring. I'm pretty excited because I have probably eight or 10 Laobans out on the farm and they have been so uniform. Even though I haven't seen but just a couple others, I feel like they're going to be fairly uniform. The Uncle Mo fashion is what they look like. They're dark bay or brown horses. I feel like we're going to have some really nice babies. I'm not as worried as I would be with another first-year sire that hasn't really thrown himself. You distinctly see Uncle Mo from the babies we have, and I think I've got enough selection to be able to feel pretty sure that's what the rest of the community is going to have. Brown: All the Laobans I have seen are very nice and tend to resemble their sire, which is a good thing. They are leggy and solid and love to run in the pasture! Wrangler is especially nice, but they all look good. Meanwhile, back in Sequel's stallion paddocks, the farm's staff shared a video of Laoban taking full advantage of his off-season by showing his playful side with his favorite ball. 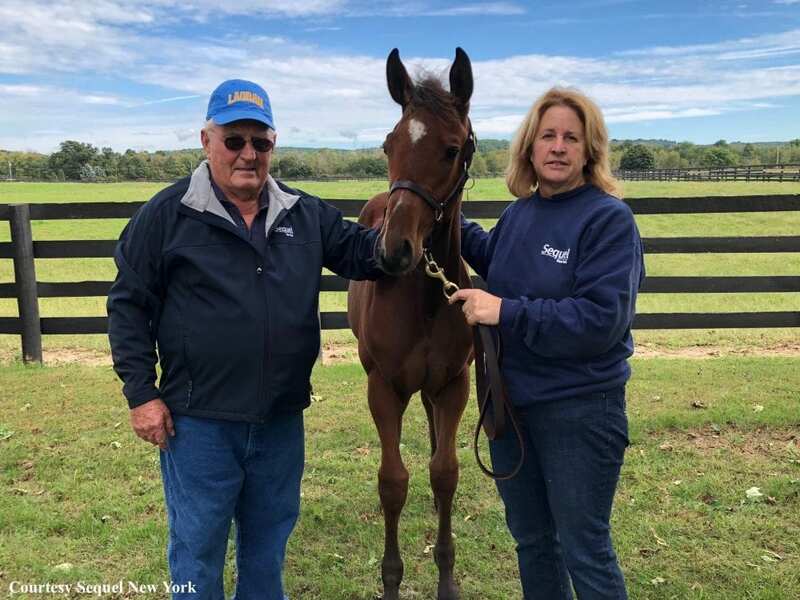 This entry was posted in Bloodstock, Features, Follow A Foal, NL Article and tagged Becky Thomas, fasig-tipton saratoga fall mixed sale, Follow a Foal, laoban, Lyn Burleson, Molly Lightner, sequel new york, teri brown, Wrangler by Joe Nevills. Bookmark the permalink.